On the morning of September 4, 1813, the Benton brothers arrived in Nashville and took their saddle-bags to the City Hotel, to avoid, Colonel Benton said, a possibility of unpleasantness, as Jackson and his friends were accustomed to make their headquarters at the Nashville Inn, diagonally across the Court-House Square. Each of the Bentons wore two pistols. At about the same time Jackson, Coffee, and Stockley Hays arrived at the Inn, all armed and Jackson carrying a riding whip. The news was over town in a moment. Jackson and Coffee went to the post-office, a few doors beyond the City Hotel. They went the short way, crossing the Square and passing some distance in front of the other tavern where the Bentons were standing on the walk. Returning, Jackson and Coffee followed the walk. As they reached the hotel Jesse Benton stepped into the barroom. Thomas Benton was standing in the doorway of the hall that led to the rear porch overlooking the river. Jackson started toward him brandishing his whip. "Now, defend yourself you damned rascal!" Benton reached for a pistol but before he could draw Jackson's gun was at his breast. He backed slowly through the corridor, Jackson following, step for step. They had reached the porch, when, glancing beyond the muzzle of Jackson's pistol, Benton saw his brother slip through a doorway behind Jackson, raise his pistol and shoot. Jackson pitched forward, firing. His powder burned a sleeve of Tom Benton's coat. Thomas Benton fired twice at the falling form of Jackson and Jesse lunged forward to shoot again, but James Sitler, a bystander, shielded the prostrate man whose left side was gushing blood. The gigantic form of John Coffee strode through the smoke, firing over the heads of Sitler and Jackson at Thomas Benton. He missed but came on with clubbed pistol. Benton's guns were empty. He fell backward down a flight of stairs. 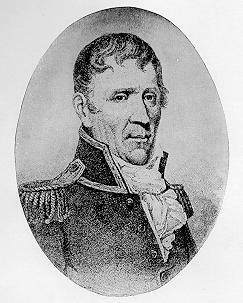 Young Stockley Hays, of Burr expedition memory, sprang at Jesse Benton with a sword cane and would have run him through had the blade not broken on a button. Jesse had a loaded pistol left. As Hays closed in with a dirk knife, Benton thrust the muzzle against his body, but the charge failed to explode. General Jackson's wounds soaked two mattresses with blood at the Nashville Inn. He was nearly dead - his left shoulder shattered by a slug, and a ball embedded against the upper bone of that arm, both from Jesse Benton's pistol. While every physician in Nashville tried to stanch the flow of blood, Colonel Benton and his partizans gathered before the Inn shouting defiance. Benton broke a small-sword of Jackson's that he had found at the scene of conflict. All the doctors save one declared for the amputation of the arm. Jackson barely understood. "I'll keep my arm," he said.